I am trying to enable SSL on WebLogic 12cR2 using a wildcard certificate. The certificate was signed by a trusted CA (I changed the domain name for this post) and the DNS infrastructure resolves the host names to the actual IPs. HTTPS access to the Web interfaces for both the Admin Server and the managed server work fine. Is there some more I need to do to use a wildcard certificate? One way is to implement a own hostname verifier. By default wildcards are not allowed. I guess I could write my own, but shouldn't Oracle's Wildcarded Host Name Verifier work? From what I see in the startup output, the wildcard verifier is not being used, even though I have configured to use it in multiple places. Yes, it should work that "Wildcarded Host Name Verifier". 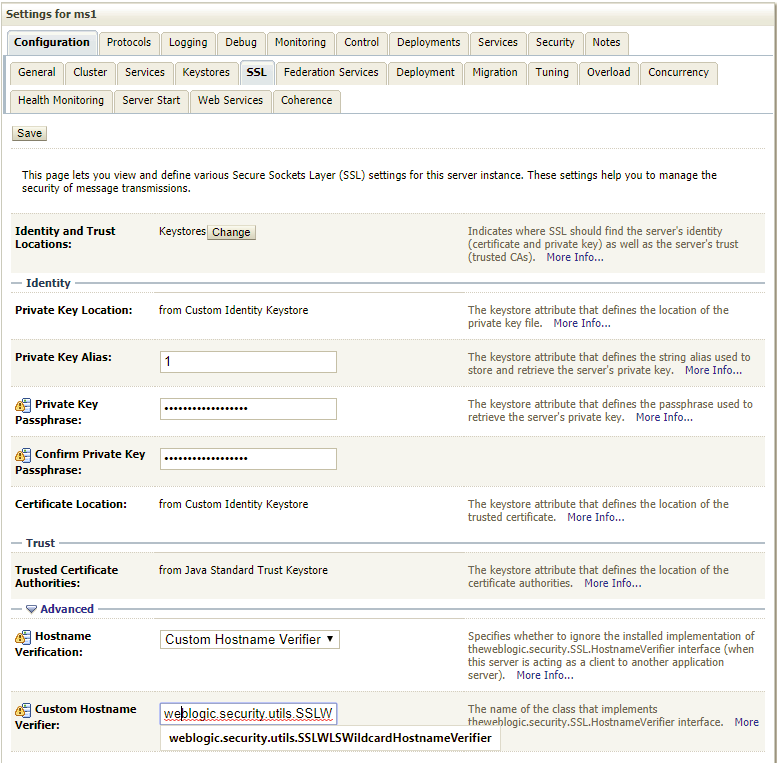 Using the configured custom SSL Hostname Verifier implementation: weblogic.security.utils.SSLWLSWildcardHostnameVerifier. I hope this will help someone, most topics and official support notes I have found on this just talk about disabling the hostname verification. Error while connecting to webservice. Is this a healthy baseline WebLogic install (log)?